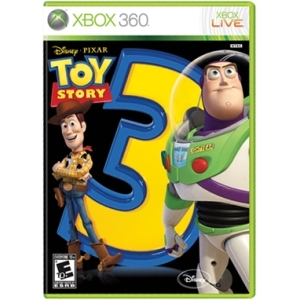 In the Toy Story 3: The video game help Buzz, woody and the rest of the toys ensure no toy gets left behind. Dive into all new heroic adventures in story mode or let your imagination run wild in exiting new open wold of Toy box Mode. You'll find several kinds of missions throughout the world. Once a mission is complete, you will earn various rewards including gold and new customizations. Add unique personality to your world. Play your way, complete missions, earn tons of points and buy new toys! These toys introduce new ways to have fun by adding different ways to play. There are many different ways to customize the way you play in Toy Box Mode. Add new buildings and change how they look! New paint options, textures, accessories, landscaping, and tons of other fun modifications make your game unique to you. Change the look of the townspeople! just toss them into various buildings in order to change their hairstyles and outfits!